Henry Sternitzky was born circa 1850 at Wisconsin. He married unknown (?) circa 1876. Married Name circa 1876 As of circa 1876,her married name was Sternitzky. She married Henry Sternitzky circa 1876. Anna Sternitzky was born circa 1892 at Wisconsin. She was the daughter of Henry Sternitzky and unknown (?). Armin Hasz was born circa 1917 at Wisconsin. He was the son of Reverand Martin Hasz and Emma Maria Elisabeth Geffert. [S250] U.S. Federal Census 1930 U.S. Federal Census, by Ancestry.com, ED10. Dwelling 56. 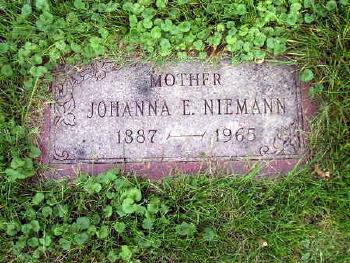 Name Variation Emma Anna Wilhelmine Niemann was also known as Nieman. Married Name 3 May 1906 As of 3 May 1906,her married name was Kuethe. Emma Anna Wilhelmine Niemann was born on 6 November 1881 at Loganville, Sauk, Wisconsin, also reported as 1881-11-26. She was the daughter of Henry Friedrich Niemann and Anna Margaretha Hasz. Emma Anna Wilhelmine Niemann married Carl Gottlob Kuethe, son of Rev. Friedrich Kuethe and Wilhelmina F. Grossman, on 3 May 1906. Emma Anna Wilhelmine Niemann died on 29 February 1972 at Colorado Springs, Colorado, at age 90. 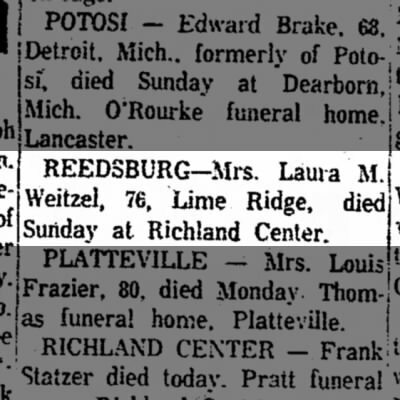 She was buried after 29 February 1972 at Harlington Cemetery, Waverly, Bremer, Iowa. 1 January 1925 Washington, Bremer, Iowa Emma Anna Wilhelmine Niemann appeared on the census of 1 January 1925 in the household of Carl Gottlob Kuethe at Washington, Bremer, Iowa. Emma Anna Wilhelmine Niemann had 2 with 2 living in 1910 children. [S244] U.S. Federal Census 1910 U.S. Federal Census, by Ancestry.com, ED44. Dwelling 12. [S243] U.S. Federal Census 1920 U.S. Federal Census, by Ancestry.com, ED56. Dwelling 115. Name Variation Carl Gottlob Kuethe was also known as Charley. Carl Gottlob Kuethe was born on 5 February 1882 at Minnesota. He was the son of Rev. Friedrich Kuethe and Wilhelmina F. Grossman. Carl Gottlob Kuethe married Emma Anna Wilhelmine Niemann, daughter of Henry Friedrich Niemann and Anna Margaretha Hasz, on 3 May 1906. Carl Gottlob Kuethe died on 9 November 1962 at Olmsted, Minnesota, at age 80. He was buried after 9 November 1962 at Harlington Cemetery, Waverly, Bremer, Iowa. 1 January 1925 Washington, Bremer, Iowa He appeared on the census of 1 January 1925 at Washington, Bremer, Iowa. Carl Gottlob Kuethe obtained US Social Security Card at Iowa; last residence Iowa. [S245] U.S. Federal Census 1900 U.S. Federal Census, by Ancestry.com, ED35. Dwelling 50. Name Variation Lenora Kuethe was also known as Lenore F.
Married Name circa 1925 As of circa 1925,her married name was Lynes. Lenora Kuethe was born circa 1908 at Iowa. Lenora Kuethe married James Kendall Lynes circa 1925. 1 January 1925 Washington, Bremer, Iowa Lenora Kuethe appeared on the census of 1 January 1925 in the household of Carl Gottlob Kuethe at Washington, Bremer, Iowa. [S250] U.S. Federal Census 1930 U.S. Federal Census, by Ancestry.com, ED17. Dwelling 34. Luella H. Kuethe was born circa November 1909 at Iowa. 1 January 1925 Washington, Bremer, Iowa Luella H. Kuethe appeared on the census of 1 January 1925 in the household of Carl Gottlob Kuethe at Washington, Bremer, Iowa. Raymond Kuethe was born circa 1913 at Iowa. He was the son of Carl Gottlob Kuethe and Emma Anna Wilhelmine Niemann. 1 January 1925 Washington, Bremer, Iowa Raymond Kuethe appeared on the census of 1 January 1925 in the household of Carl Gottlob Kuethe at Washington, Bremer, Iowa. 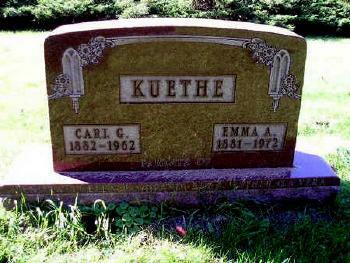 Ruth Esther Kuethe was born on 28 August 1915 at Waverly, Bremer, Iowa. 1 January 1925 Washington, Bremer, Iowa Ruth Esther Kuethe appeared on the census of 1 January 1925 in the household of Carl Gottlob Kuethe at Washington, Bremer, Iowa. Esther M. Kuethe was born circa 1917 at Bremer, Iowa. 1 January 1925 Washington, Bremer, Iowa Esther M. Kuethe appeared on the census of 1 January 1925 in the household of Carl Gottlob Kuethe at Washington, Bremer, Iowa. Name Variation James Kendall Lynes was also known as Kendall. Name Variation James Kendall Lynes was also known as J. Kendall. James Kendall Lynes was born circa 1902 at Iowa. He married Lenora Kuethe, daughter of Carl Gottlob Kuethe and Emma Anna Wilhelmine Niemann, circa 1925. Name Variation Johanna E. Kuethe was also known as Hannah. Married Name before June 1917 As of before June 1917,her married name was Niemann. Johanna E. Kuethe was born in May 1887 at Minnesota. Johanna E. Kuethe married Frederick William Niemann, son of Henry Friedrich Niemann and Anna Margaretha Hasz, before June 1917. Johanna E. Kuethe witnessed the marriage of August G. Baumgarten and Bertha A. Niemann in March 1918 at Iowa; Announcement is made of the recent marriage of Miss Bertha Niemann of Madison and A. G. Baumgarten of Loganville, which took place at the home of the bride's sister, Mrs. Carl Kuethe, Waverly, Iowa, Rev. Emil H. Rausch officiating. The couple was attended by the bride's brother and sister-in-law, Mr. and Mrs. Frederick Niemann. Mr. and Mrs. Baumgarten left on a trip to Florida and will be at home to their friends after the first of April in Loganville. (published in The Capital Times, Madison, WI, 09 Mar 1918). 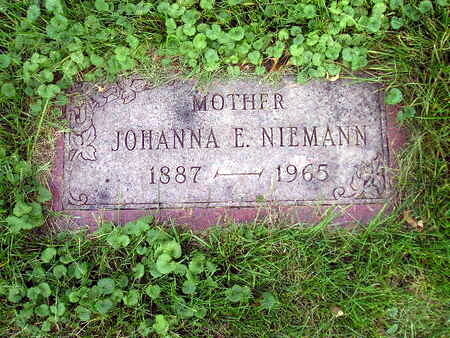 Johanna E. Kuethe died on 22 March 1965 at age 77. 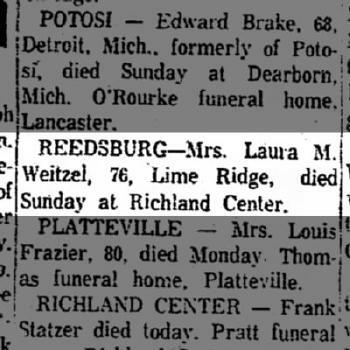 She was buried after 22 March 1965 at Harlington Cemetery, Waverly, Bremer, Iowa. 1 January 1925 Maxfield, Bremer, Iowa Johanna E. Kuethe appeared on the census of 1 January 1925 in the household of Frederick William Niemann at Maxfield, Bremer, Iowa. 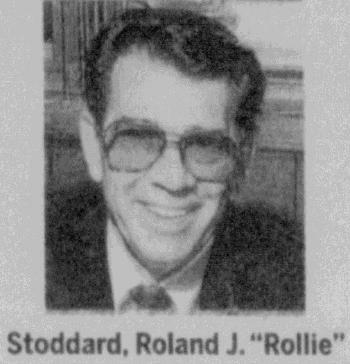 Name Variation Roland J. Stoddard was also known as Rolland. 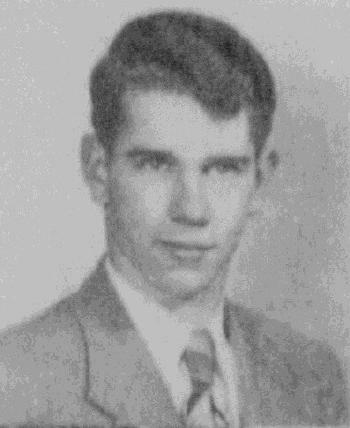 Roland J. Stoddard was born on 25 September 1934 at Bear Creek, Sauk, Wisconsin. He was the son of Raymond Harold Stoddard and Madge Mary Weitzel. Roland J. Stoddard died on 28 December 2015 at age 81 Roland J. “Rollie” Stoddard, age 81 passed away on Tuesday, December 28, 2015 at the Fountainhead Homes/Raymond House in DeForest after an extended illness. Rollie was born on September 25, 1934 in the Town of Bear Creek, the son of Raymond and Madge (Weitzel) Stoddard. Rollie graduated from Spring Green High School where he took much pride in his accomplishments as a star football player. Shortly after graduation, he served the U.S. Army during the Korean War attaining the rank of Sergeant. Upon his return he assisted his father on the family farm and eventually became a carpenter. Rollie worked to become a skilled finish carpenter and eventually started Stoddard Construction and built many homes in the Spring Green area. Rollie moved to Madison in the early 1980’s and was a salesperson selling energy efficient lighting solutions. Rollie enjoyed listening to records, playing cribbage, putting puzzles together and was a Badger and Packer fan. Rollie is survived by seven children, Phil of Madison; Brian (Kris) of Spring Green; Sally Dischler of Sun Prairie; Mike (Linda) of Spring Green; Sandy (Dean) DuCharme of Spring Green; Jan (Jennifer) of Mt. Horeb; Suzi (Tom) Bindl of Plain; their mother Ruth (Baryenbruch) Stoddard of Spring Green; 21 grandchildren; 2 great grandchildren; sister Lila “Dody” Pouliot of Batesville AR; brother-in-law William Walsh of Plain and many nieces and nephews. He was preceded in death by his parents; daughter-in-law Marcy Stoddard; son-in-law Bob Dischler; sisters Juanita “Bunny” Crary and Jeannine “Teenie” Walsh; brother Reginald Stoddard; brother-in-law, Keith Crary; sister-in-law, Marge Stoddard. A private family service was held on Saturday, January 2, 2016 at St. Patrick’s Catholic Church, Loretta with burial in the church’s cemetery. The family would like to acknowledge and thank Tammy and the Southside Coalition for the Elderly whose assistance over these past years made many difficult decisions much easier and you were truly a blessing to our family. To the Raymond house staff for providing dad the care that we all knew he needed and you accepted that challenge….and it was a challenge at times and we are forever grateful for your patience and care. To Agrace Hospice who provided dad with the additional care he required these last few weeks. Your organization is truly one that has made this difficult time for our family much easier knowing he was comfortable and is now at peace. The Richardson-Stafford Funeral Home of Spring Green assisted the family with arrangements. William Walsh was the son of William L. Walsh. William Walsh married Jeannine M. Stoddard, daughter of Raymond Harold Stoddard and Madge Mary Weitzel, on 5 January 1949. Married Name 5 August 1903 As of 5 August 1903,her married name was Weitzel. Laura M. Powell was born circa 1884 at Wisconsin. She married Jacob R. Weitzel, son of Peter Weitzel and Mary Zeckman, on 5 August 1903 at Sauk, Wisconsin. Laura M. Powell died on 18 September 1960. Laura M. Powell had 1 with 1 living in 1910 children. [S244] U.S. Federal Census 1910 U.S. Federal Census, by Ancestry.com, ED110. Dwelling 68. [S243] U.S. Federal Census 1920 U.S. Federal Census, by Ancestry.com, ED170. Dwelling 20. Robert Weitzel was born circa 1908 at Wisconsin. He was the son of Jacob R. Weitzel and Laura M. Powell. Name Variation Francis A. Weitzel was also known as F. A. Name Variation Francis A. Weitzel was also known as Frank. Francis A. Weitzel was born in August 1862 at Wisconsin tombstone lists birth year as 1860. Francis A. Weitzel married Margaret Anna Smith, daughter of Peter Smith and Margaret Quigley, circa 1887. Francis A. Weitzel died on 12 February 1926 at age 63. [S245] U.S. Federal Census 1900 U.S. Federal Census, by Ancestry.com, ED129. Dwelling 67. [S244] U.S. Federal Census 1910 U.S. Federal Census, by Ancestry.com, ED110. Dwelling 86. [S243] U.S. Federal Census 1920 U.S. Federal Census, by Ancestry.com, ED160. Dwelling 32. Name Variation Margaret Anna Smith was also known as Anna. Name Variation Margaret Anna Smith was also known as Smyth. Married Name circa 1887 As of circa 1887,her married name was Weitzel. Margaret Anna Smith was born in March 1864 at Wisconsin tombstone lists birth year as 1863. She was the daughter of Peter Smith and Margaret Quigley. Margaret Anna Smith married Francis A. Weitzel, son of Jacob Weitzel and Katherine Misslich, circa 1887. Margaret Anna Smith died on 18 November 1934 at age 70. Margaret Anna Smith had 5 with 5 living in 1900 children. She had 6 with 6 living in 1910 children. [S246] U.S. Federal Census 1880 U.S. Federal Census, by Ancestry.com, NA Film Number T9-1446 Page Number 55C. John F. Weitzel was born on 11 July 1889 at Wisconsin also reported as Jul 1890. He was the son of Francis A. Weitzel and Margaret Anna Smith. John F. Weitzel died on 14 September 1963 at age 74. Peter J. Weitzel was born in July 1899 at Wisconsin. Peter J. Weitzel died on 5 October 1957 at age 58. Jacob Herbert Weitzel was born on 5 October 1892 at Bear Creek, Sauk, Wisconsin, military record lists birth as 5 Oct 1893. Jacob Herbert Weitzel married Ethel R. (?) circa 1913. Jacob Herbert Weitzel died on 29 September 1961 at age 68. [S250] U.S. Federal Census 1930 U.S. Federal Census, by Ancestry.com, ED8. Dwelling 95. Married Name circa 1913 As of circa 1913,her married name was Weitzel. Ethel R. (?) was born in 1896 at Wisconsin. She married Jacob Herbert Weitzel, son of Francis A. Weitzel and Margaret Anna Smith, circa 1913. Ethel R. (?) died in 1969. 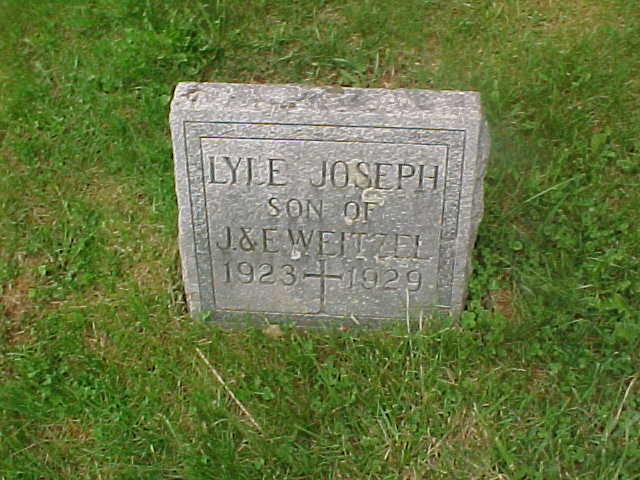 Lyle Joseph Weitzel was born in 1923. He was the son of Jacob Herbert Weitzel and Ethel R. (?). 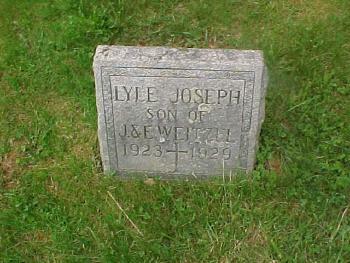 Lyle Joseph Weitzel was buried in 1929 at St. Patrick's Catholic Cemetery, New Loreto, Bear Creek, Sauk, Wisconsin. William H. Weitzel married Gertrude A. Vosen, daughter of (?) Vosen and (?) Ellesser. William H. Weitzel was born on 16 December 1887 at Wisconsin also reported as Dec 1888. 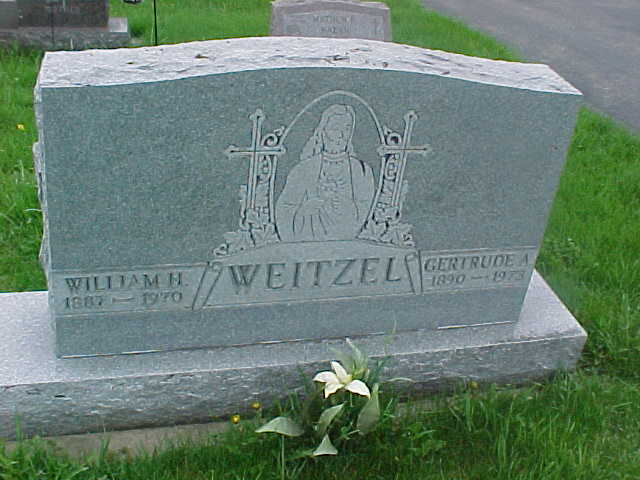 William H. Weitzel died on 4 July 1970 at age 82. He was buried after 4 July 1970 at St. Patrick's Catholic Cemetery, New Loreto, Bear Creek, Sauk, Wisconsin. [S243] U.S. Federal Census 1920 U.S. Federal Census, by Ancestry.com, ED160. Dwelling 31. Married Name Her married name was Weitzel. Gertrude A. Vosen married William H. Weitzel, son of Francis A. Weitzel and Margaret Anna Smith. Gertrude A. Vosen was born on 13 May 1890. She was the daughter of (?) Vosen and (?) Ellesser. Gertrude A. Vosen died on 3 November 1973 at age 83. She was buried after 3 November 1973 at St. Patrick's Catholic Cemetery, New Loreto, Bear Creek, Sauk, Wisconsin. Married Name August 1941 As of August 1941,her married name was Peckham. Geraldine C. Weitzel was born on 24 November 1920 at Sauk, Wisconsin. She was the daughter of Jacob Herbert Weitzel and Ethel R. (?). Geraldine C. Weitzel married Stanley H. Peckham in August 1941. Geraldine C. Weitzel died on 2 July 2005 at age 84 Geraldine C. Peckham, age 84, passed away on Saturday, July 2, 2005, at St. Marys Medical Center after a brief illness. She was born in the Bear Valley area on Nov. 24, 1920, the daughter of Jacob and Ethel Weitzel. Geraldine graduated from Elroy High School and played on the Bear Valley State Fair Tournament Softball Championship teams. She then attended school in Milwaukee, where she earned her cosmetology degree. Geraldine married Stanley H. Peckham in August 1941. He preceded her in death in 1988. She owned and operated Geraldine's Beauty Salon in Madison for more than 40 years and taught and trained many area hairstylists. Geraldine was an avid bowler and joined numerous leagues where she developed many lasting friendships. She enjoyed gardening, but loved most of all, the time spent with her family. Survivors include her children, Stan L. (Sue) of Madison, Steve (Julia) of Middleton and Pamela (Greg) Haack of Mount Horeb; her grandchildren, Stan L. Jr., Matthew (Samantha Egan), Benjamin and Jessica Peckham, Melissa (Steve) Dale, Jamie, Daniel and John Haack and Lucas Blindauer; a great-grandchild due in October; a brother-in-law, Martin Evers; a special niece, Susan Lincoln; many other treasured nieces and nephews; and many friends. In addition to her husband, she was preceded in death by an infant son, Terry; an infant grandson, William; three brothers, Lyle, Francis and Walter; her sisters, Leona Evers and Patricia Boschuetz; and an infant sister, Margaret Ann. A mass of Christian burial will be held at ST. BERNARD'S CATHOLIC CHURCH, 7450 University Ave., Middleton, at 11 a.m. on Thursday, July 7, 2005, with Monsignor Douglas Dushack presiding. Burial will be in Middleton Junction Cemetery. Friends may call from 4 p.m. until 7 p.m. at the GUNDERSON WEST FUNERAL HOME, 7435 University Ave. on Wednesday, July 6, 2005, and also from 10 a.m. until the time of services on Thursday at the church. Gunderson West Funeral & Cremation Centers 7435 University Ave. (608) 831-6761 www.gundersonfh.com. Stanley H. Peckham married Geraldine C. Weitzel, daughter of Jacob Herbert Weitzel and Ethel R. (? ), in August 1941. Stanley H. Peckham died in 1988. Terry Peckham was the son of Stanley H. Peckham and Geraldine C. Weitzel. Terry Peckham died at died as an infant. Francis Weitzel was born circa 1918 at Wisconsin. Francis Weitzel died before July 2005.